“Prevention is always better than cure”, is a well-known proverb which we have been learning from our childhood. But many of us are not aware about the different preventive measures. 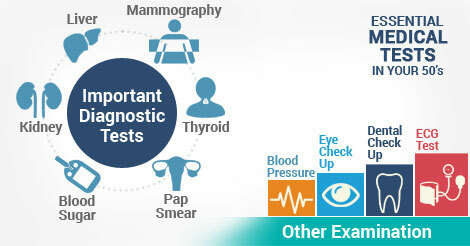 Diagnostic tests are one of the most crucial preventive measures to avoid major illness and related morbidity and mortality. Proper diagnosis becomes more important with advancement in age. Here is the list of some very important diagnostic tests which all of us must take in our 50’s. People with family history of heart diseases and diabetes must ensure to take both these test to identify early symptoms. With early detection of high blood glucose and cholesterol levels, one can modify lifestyle and consult physician to avoid chronic diseases. Liver and kidney functioning can get affected with advancement in age. Impairment of these vital organs can hugely impact the excretion of waste metabolites as well as drug by products from the body and can lead to serious complication. People who takes any kind of medications must ensure to take these tests to avoid serious drug side effects caused due to their improper removal from the body. Thyroid hormones are crucial hormones for the body as they maintain bone density, metabolic functions of the body, and growth and development. Hormonal changes are common with increase in age and early detection of thyroid hormone changes can help in preventive exacerbation of diseases like hypertension, diabetes, arthritis, goiter, and many more. It is an important test to identify early signs of cervical cancer, which is very lethal in women. Women who are in their menopause stage must surely consult a gynecologist and take a pap-smear test. Mammography is an ultrasound scanning of breast which can help to identify early sign of breast cancer. All women must practice breast self-examination and take mammography test as soon as they turn 40. Routine blood pressure examination, eye check-up, dental checkup, and electrocardiogram (ECG) are also advisable for people over 50 years of age.